You know it’s a hamburger’s best friend, but do you know these tasty nuggets about the king of condiments? 1. Tomatoes haven’t always been a key player. The first recorded recipe for ketchup hails from 544 A.D. China (where the fish-based sauce was referred to by sailors as ke-tchup), which calls for "the intestine, stomach, and bladder of the yellow fish, shark and mullet," and 20 days of incubation under summer sunlight before it’s ready for consumption. In the spring or fall, increase that incubation period to 50 days—or 100 days during winter. 2. European explorers took it home. 3. Americans may have added the tomatoes. Despite the difficultly Europeans had in replicating soy-based ketchup, they weren't ready to take the plunge into tomato ketchup. The major stumbling block: for centuries, Europeans labored under the misconception that tomatoes were poisonous. Americans were more willing to dabble with the fruit. The first known written recipe for tomato ketchup came from Philadelphia horticulturist James Mease in 1812. Mease’s recipe included spices, brandy, and, of course, tomatoes, which the scientist referred to as "love apples." 4. Ketchup was a miracle drug. In 1834, Ohio physician Dr. John Cook Bennett took to the newspapers to herald tomatoes as a cure-all for "just about everything from dyspepsia to cholera." As part of this campaign, the good doctor published recipes for tomato-based ketchup. 5. The early going was rough. Ketchup earned a nasty reputation in the 1860s when unscrupulous makers used excessive preservatives and coal tar to give the condiment its iconic red coloring. In 1866, French cookbook author Pierre Blot penned a warning against ketchup, calling it "filthy, decomposed, and putrid," and stating his convictions that "many cases of debility and consumption" come from "eating such stuff." You can’t keep a good condiment down, though. The Oxford Companion points out that by the close of the 19th century, tomato ketchup had become an American staple. A 1901 study found that Connecticut shoppers had access to a whopping 94 brands of ketchup. 6. Heinz made way more than 57 varieties. Henry J. Heinz saw an advertisement for 21 styles of shoes while riding a New York City train in 1896 and was inspired to create similar branding for his own company. Even though Heinz’s company manufactured more than 60 products, the condiment entrepreneur went with "57 Varieties," an amalgam of his own lucky number, 5, and his wife's, 7. 7. “Ketchup” was another branding coup from Heinz. What’s the difference between “ketchup” and “catsup?” There isn’t one. Heinz began calling his product ketchup to help it stand out from all of his competitors who were peddling catsup. Given the ubiquity of Heinz ketchup, it’s safe to say the ploy worked. 8. Heinz’s 57 has another non-marketing use. That "57" isn't just clever branding—it’s also a key component of a life hack for easing more ketchup out of the classic Heinz glass bottles. According to the company, applying a "firm tap to the sweet spot on the bottle—the 57" is the trick for getting ketchup to flow. Don't feel left out if this is news to you; Heinz claims only 11 percent of ketchup connoisseurs are clued in to the trick. 9. Ketchup isn’t going to win any races. Speaking of the classic glass Heinz bottle: ketchup flows out of the vessel at a rate of .028 miles per hour. For comparison, a typical garden snail moves at a zippy 0.03 miles per hour. 10. Illinois is a hotbed of ketchup world records. Collinsville, Illinois proudly boasts two ketchup-related world records: the world's largest ketchup bottle sits within the city's confines. The behemoth bottle is 170 feet tall and was built in 1949 for Collinsville's G.S. Suppiger catsup-bottling plant. The city also made the world's largest ketchup packet in 2007; Heinz donated 4,000 glass ketchup bottles for the mammoth packet, which held 127 gallons of ketchup. 11. 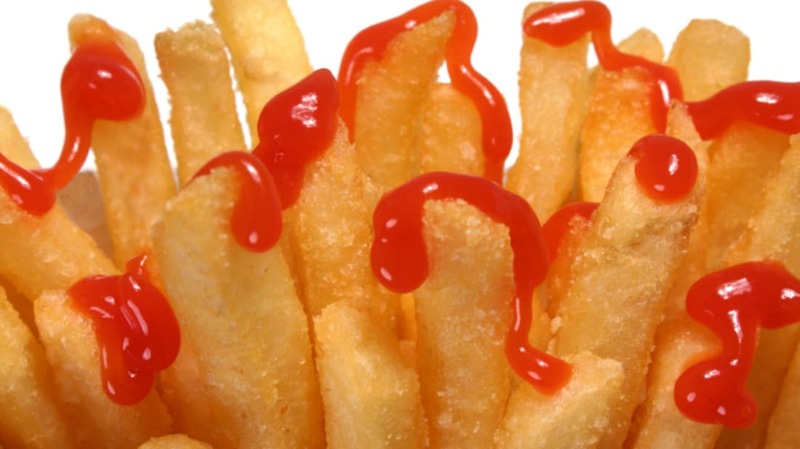 Americans really, really love ketchup. According to The Oxford Companion, Americans slather 10 billion ounces of ketchup on their food each year—that’s roughly three bottles of ketchup for every man, woman, and child.